Corby town centre skyline, seen from Oakley Woods. 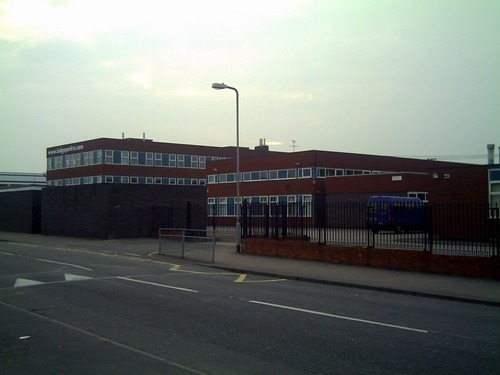 Corby is a town and borough located in the county of Northamptonshire, England. It is located 23 miles (37 km) north-east of the county town, Northampton. The borough had a population of 61,300 at the 2011 Census. Figures released in March 2010 revealed that Corby has the fastest growing population in both Northamptonshire and the whole of England. 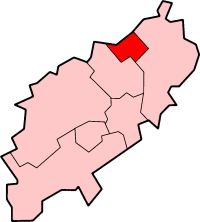 The Borough of Corby borders onto the Borough of Kettering, the District of East Northamptonshire, the District of Harborough and the unitary authority county of Rutland. The town was at one time known locally as "Little Scotland" due to the large number of Scottish migrant workers who came to Corby for its steelworks. 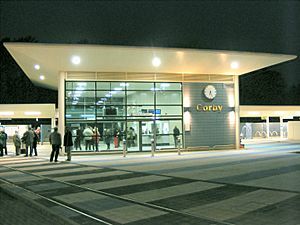 Recently, Corby has undergone a large regeneration process with the opening of Corby railway station and Corby International Pool in 2009 and the Corby Cube building opening in 2010. This is home to Corby Borough Council offices and also houses a 450 seat theatre, a public library and other community amenities. . The Borough of Corby consists of the town of Corby, as well as the villages of Weldon, Rockingham, Gretton, Cottingham, Middleton, East Carlton, Stanion and Little Stanion. Mesolithic and Neolithic artefacts have been found in the area surrounding Corby and human remains dating to the Bronze Age were found in 1970 at Cowthick. The first evidence of permanent settlement comes from the 8th century when Danish invaders arrived and the settlement became known as "Kori's by" – Kori's settlement. The settlement was recorded in the Domesday Book of 1086 as "Corbei". Corby's emblem, the raven, derives from an alternative meaning of this word. These Danish roots were recognised in the naming of the most southern of the town's housing estates, Danesholme, around which one of the Danish settlements was located. Corby was granted the right to hold two annual fairs and a market by Henry III in 1226. In 1568 Corby was granted a charter by Elizabeth I that exempted local landowners from tolls (the fee paid by travellers to use the long distance public roads), dues (an early form of income tax) and gave all men the right to refuse to serve in the local militia. A popular legend is that the Queen was hunting in Rockingham Forest when she (dependent on the legend) either fell from her horse or became trapped in a bog whilst riding. Upon being rescued by villagers from Corby she granted the charter in gratitude for her rescue. Another popular explanation is that it was granted as a favour to her alleged lover Sir Christopher Hatton. The Corby Pole Fair is an event that has taken place every 20 years since 1862 in celebration of the charter. According to a newspaper report dated 14 June 1862 which focuses on the extravagances of the Fair, the fugitive slave John Anderson was described as being educated in the Corby British School, giving the town an unusual link to slavery in the United States. The next pole fair is to be held in 2022. The local area has been worked for iron ore since Roman times. An ironstone industry developed in the 19th century with the coming of the railways and the discovery of extensive ironstone beds. By 1910 an ironstone works had been established. In 1931 Corby was a small village with a population of around 1,500. It grew rapidly into a reasonably sized industrial town, when the owners of the ironstone works, the steel firm Stewarts & Lloyds, decided to build a large integrated ironstone and steel works on the site. The start of construction in 1934 drew workers from all over the country including many workers from the depressed west of Scotland and Irish labourers. The first steel was produced in October 1935 and for decades afterwards the steel works dominated the town. By 1939 the population had grown to around 12,000, at which time Corby was thought to be the largest "village" in the country, but it was at that point that Corby was re-designated an urban district (see the Local Government section below). During the Second World War the Corby steelworks were expected to be a target for German bombers but in the event there were only a few bombs dropped by solitary planes and there were no casualties. This may be because the whole area was blanketed in huge dense black, low-lying clouds created artificially by the intentional burning of oil and latex to hide the glowing Bessemer converter furnaces at the steelworks from German bomber crews. The only known remaining scars from German attacks can be found in the form of bullet holes visible on the front fascia of the old post office in Corby village (now known as Decades bar and restaurant). 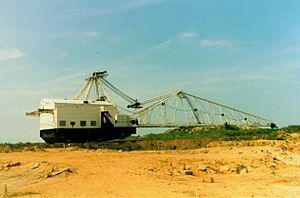 The Corby steelworks made a notable contribution to the war effort by manufacturing the steel tubes used in Operation Pluto (Pipe Line Under the Ocean) to supply fuel to Allied forces on the European continent. In 1950, with a population of 18,000, Corby was designated a New Town with William Holford as its architect. By 1951, he prepared the development plan with a car-friendly layout and many areas of open space and woodland. In 1952, Holford produced the town centre plan and in 1954 the layout for the first 500 houses. The town now underwent its second wave of expansion, mainly from Scotland. In 1967 the British steel industry was nationalised and the Stewarts & Lloyds steel tube works at Corby became part of British Steel Corporation. In 1973 the government approved a strategy of consolidating steel making in five main areas – South Wales, Sheffield, Scunthorpe, Teesside and Scotland – most of which are coastal sites with access to economic supplies of iron rich imported ores. Thus in 1975 Harold Wilson's Labour government agreed a programme that would lead to the phasing-out of steel making in Corby. By the end of 1981 over 5,000 jobs had been lost from British Steel in Corby, and further cuts took the total loss to 11,000 jobs, leading to an unemployment rate of over 30%. Steel tube making continued, however, initially being supplied with steel by rail from Teesside and later from South Wales. The title track of Steeltown by Big Country is about the loss of jobs in Corby. New industry was subsequently attracted to the town when the Thatcher government designated it as an Enterprise Zone. By 1991 unemployment had returned to the national average. The recovery of Corby was explained in 1990 by John Redwood, then a junior minister in the Department of Trade and Industry, as being a result of the establishment of the Enterprise Zone, the promotion of Corby by the Thatcher government, the work of private investors and the skills of the work force. Others believe the town's recovery was significantly assisted by its central location and substantial grants from the EU. 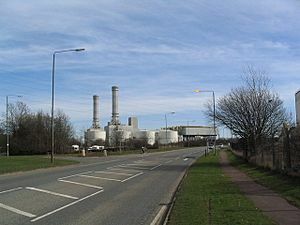 To the north of Corby, on the industrial estates, is a 350MW power station built in 1994; and the Rockingham Motor Speedway built in 2001. In 2012, Corby bid to gain city status as part of Queen Elizabeth II's Diamond Jubilee celebrations. However, it lost out to Perth, Chelmsford and St Asaph. 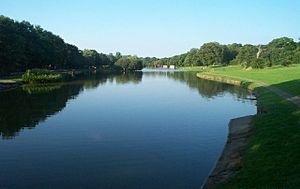 It is recorded in 1851 that the accent spoken in the northern parts of Northamptonshire would have spoken with an accent more recognisable as a "West Country dialect". Scottish migration to Corby has created a unique population in the borough, evidenced most clearly in the 'Corby accent', which is often described as sounding Glaswegian. The link with Scotland is a strong feature of the area: according to the 2001 Census, there were 10,063 Scottish-born in the Corby Urban Area – 18.9% of the population. A further 1.3 per cent were born in Northern Ireland. It has been estimated that a further third of the population are Scottish or of Scottish descent. The Scottish heritage is cherished by many inhabitants. There are Scottish social and sporting clubs and there are many fervent supporters of the Rangers and Celtic football clubs (indeed, Corby was home to the largest Rangers Supporters' Club outside Glasgow and Northern Ireland until its closure in February 2013) as well as the Scottish National Team. Many shops sell Scottish foods and a supermarket even introduced Gaelic signs to their Corby store (but they have since removed them). An annual Highland Gathering featuring traditional Scottish sports, music and dancing is held in the town. Corby is the only town in England apart from London with two Church of Scotland churches. Local legend states that Corby sees the highest sales of the Scottish soft drink Irn-Bru of anywhere outside Scotland. Asda Corby is stated to sell 17 times more Irn-Bru than any other store in England. Its popularity is cemented by the fact that it is available for purchase in all bars, nightclubs and pubs in the area. In 2014, Corby held a mock referendum in the run up to the Scottish independence referendum. 576 votes were cast, with 162 voting for Scottish independence and 414 voting against. According to the 2001 Census 1.7% of the population are non-white and the average age of the population (37.2) is slightly lower than the average for England and Wales (38.6). 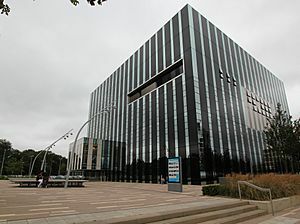 November 2010 saw the opening of the Corby Cube, a major development in the town centre. As well as new council chamber, registrar office, and public library, the Cube is home to a 450-seat theatre and 100 capacity studio theatre. A programme of live theatre, dance, music and standup comedy is complemented by a participation programme encouraging all parts of Corby community to get involved. Recently the theatre started screening films, twice a week and including current mainstream releases and the best in world, independent and art house cinema. A report in 2012 revealed that the Cube was built with dangerous design flaws and almost double its original estimated costs and a capacity of only half of what was planned. A crater on Mars discovered in the late 1970s was named after Corby, in reference to a famous transcript of a conversation in June 1969 between the crew of the Apollo 11 mission and mission control, whereby world news was relayed to the crew, amongst it was the news that "in Corby, an Irishman named John Coyle won the World's Porridge Eating Championship by consuming 23 bowls of instant oatmeal in 10 minutes". The reply from Apollo 11 "I'd like to enter Aldrin in the porridge eating contest next time; he's on the 19th bowl. Rodger." Corby's main football team is Corby Town F.C., who play in the National League North. The Steelmen play at Steel Park and have an average home attendance of 472 in 2014/15. The town's other semi-professional football club are Stewarts & Lloyds Corby F.C., who play in the United Counties League. S&L play their home matches at Occupation Road. Corby is also home to the Corby East Midlands International Swimming Pool which was built in 2009. It is also home to the Stewarts and Lloyds Rugby Football Club which despite the long closure of the steel industry maintains its proud heritage of its industrial roots. The club plays in the RFU's Midland South East 3 division. Corby also has an athletics club for under-11's to over 60's. In the Youth Development League, the upper age group gained promotion to Midland East 1 and gained promotion in the Heart of England Athletics League. The town is located along the A43, A427, A6003 and is 6 miles (9.7 km) from the A14 at Kettering. Corby lies within two hours' drive of four international airports: Birmingham, Luton, Stansted and East Midlands. Being a new town, Corby's road network is different from that of older towns. There are several dual carriageways, most of the principal roads have wide reservations and high speed limits and pedestrian crossings over them are often underpasses. However, Corby is only connected by dual carriageway to one neighbouring town, Kettering (the A6003). All other roads into the town are single carriageways. Corby is served by six bus routes under the Corby Star brand name. Service X4 connects the town with Peterborough, Oundle, Weldon, Danesholme, Kettering, Isham, Wellingborough, Earls Barton, Northampton, Roade, Grafton Regis, Milton Keynes and London. It is also operated by Stagecoach. National Express coaches also provide long-distance connections to the north and Scotland. Plans to build a new bus station in Corby are being considered by the council following the closure of the old bus station in August 2002. The newly built station opened on 23 February 2009. East Midlands Trains runs hourly services to London St Pancras via Kettering and Wellingborough. There is also a limited peak time service running north to Oakham and Melton Mowbray. 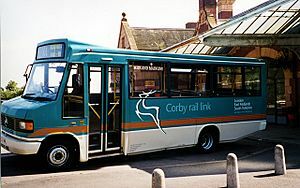 It was later agreed that the 'Corby Rail Bus', the X1 service between Corby and Kettering operated by Stagecoach, would be kept running after the opening of the new station – though passenger numbers will be monitored and if they fall off significantly then the service may be reduced or terminated. Train services had been due to start on 14 December 2008, but EMT admitted that it failed to secure the four new trains it needed. An article in Corby's local newspaper stated that the service would be starting on 23 February 2009. Corby used to be described as the largest town in Great Britain not to have a railway station, or access within 5 miles (8.0 km) of one — many other towns and localities claim this dubious honour (e.g. Gosport, Dudley, Newcastle under Lyme) but all of these places have locally available railway stations in adjacent suburban areas. Previously the nearest station was 7 miles (11 km) south in Kettering since the closure of the original station under the Beeching Axe in April 1966. The Kettering-Corby-Melton Mowbray section remained open for freight and through passenger trains, passing through the 1,760-metre (1,920 yd) Corby Tunnel and crossing the River Welland on the colossal 82-arch Welland Viaduct. Corby has an Urban Regeneration Company - North Northants Development Company, which now covers the whole of North Northamptonshire rather than just Corby (it was previously known as Catalyst Corby). The company is working closely with Corby Borough Council, Land Securities (town centre owners), the East Midlands Development Agency and the Homes and Communities Agency to regenerate the town centre as part of the masterplan for the whole town. The population of Corby town is expected to double in the next 30 years through housing on large estates such as Prior's Hall, Little Stanion, Oakley Vale and Great Oakley. In October 2007 Corby's new shopping precinct, Willow Place, opened. In addition Parkland Gateway, the Borough's £50m investment situated adjacent to Willow Place and including a new Olympic-sized swimming pool and civic hub (due for completion in November 2010), is being built following its approval in January 2007. Work began on the project in October 2007 and the Corby East Midlands International Pool was officially opened by Olympian Mark Foster in July 2009. Although the Evolution Corby project is currently on hold, limited aesthetic augmentation work within the town centre continues. Corby town centre has recently gained a Wetherspoon Pub & Hotel called "The Saxon Crown". It is a refurbished 1960s Cooperative Store and its name refers to the history of the area: the village of Corby derives its name from Kori, a leader of Danish invaders who settled in a clearing in Rockingham Forest. The local Conservative Party, who call themselves "Team Corby", have argued that further regeneration in Corby should be delivered through bringing visitors to the town to visit its numerous historic sites. They argue that a co-ordinated tourism programme will increase and diversify the population available for the leisure industry to market to, and thus result in more local leisure facilities being opened. Stephen Fry was the voice-over in a campaign running in London from 2010 to entice people to move to Corby and the surrounding area including Rushden, Kettering and Wellingborough. The North Northamptonshire Development Corporation's campaign uses newspaper and London Underground advertisements, and also local radio with North Northamptonshire, being dubbed 'North Londonshire', as the area is only an hour from London St Pancras by rail. The campaign was criticised by residents in the county proud of the Northamptonshire name. As with the rest of the British Isles and Northamptonshire, Corby experiences a maritime climate with cool summers and mild winters. The nearest official Metoffice weather station for which online records are available is Caldecott, about 3 miles (4.8 km) north-north west of Corby town centre and in the Welland valley on the Northamptonshire–Leicestershire border. Observations have now ceased, and the nearest operational weather station is Wittering, some 13 miles (21 km) to the north east. The exact situation of the weather station at Caldecott is at 53 m and in a valley location, meaning generally higher daytime temperatures than Corby itself (at 100–130 m altitude) but also higher frost averages. Caldecott is in fact frostier than the frost hollow at Shawbury (70.2 frost days vs. 64 frost days at Shawbury), where England's lowest December temperature was recorded. However, given temperatures between the 1961–90 period (displayed below) and 1971–2000 period have typically increased by 0.5 to 0.7 Celsius, offset by the fall in temperature of a similar value between the 53 m of the weather station and the 120 or so of Corby town centre, the figures should provide accurate representation (in daytime values at least) of the town proper for the 1971–2000 period. The lowest temperature recorded was −23.3 °C (−9.9 °F) during January 1987, the highest temperature of 35.0 °C (95.0 °F) was recorded in August 1990. Corby Facts for Kids. Kiddle Encyclopedia.